The JOIDES Resolution and the Liftboat Myrtle are both being used as platforms for ocean scientific drilling, but, beyond that, they don’t have a lot in common. The JOIDES Resolution is dedicated to scientific ocean drilling. For most of the past thirty years, that has been its specialty. The Liftboat Myrtle is not a scientific research ship, at least normally. Its typical gig is to help service oil and gas well platforms in the shallow waters of the Gulf of Mexico. The JOIDES Resolution spends all its time (except when it’s being overhauled) on the surface of the water. The Liftboat Myrtle can sail on the water. But it can also lift itself out of the water and suspend itself in the air. The Myrtle has three stilts (actually they’re called legs) that each have a foot (actually they’re called pads). Each foot is 40 feet long and 16 feet wide. The legs and their pads can be lowered to the seafloor until they are standing on the ground. Once the pads are stable, the ship can continue to rise up until it is resting comfortably above the water. Right now, the pads are on the seafloor about 56 feet below the sea surface. The main deck of the ship is about 40 feet above the sea surface. So the legs are holding the ship up about 100 feet above the seafloor. The legs are actually long enough that they could keep lifting the ship up another 150 feet. The JOIDES Resolution has a permanent drilling derrick it takes everywhere it goes. 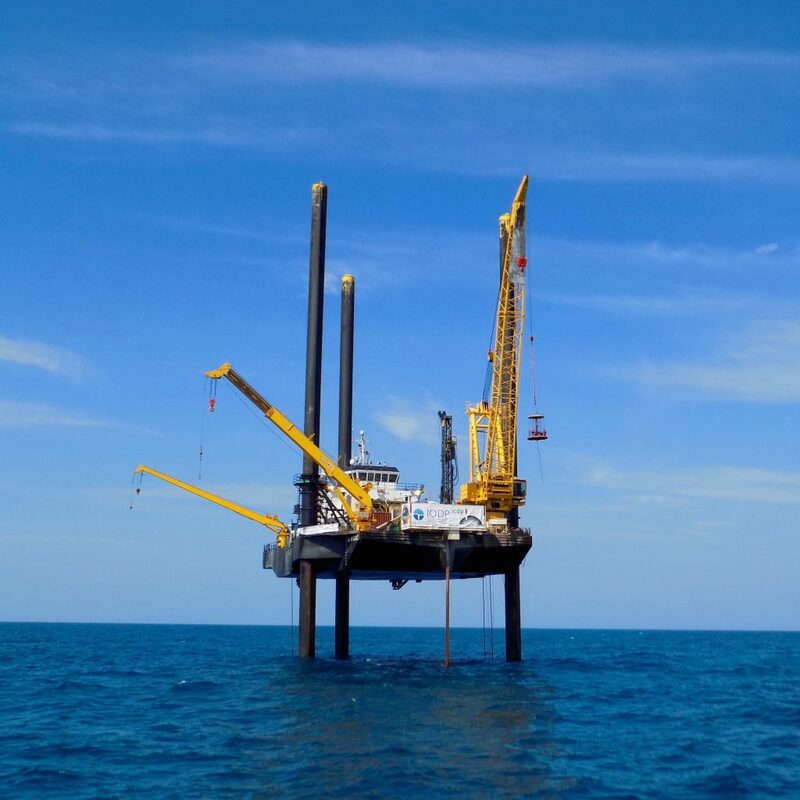 The Liftboat Myrtle did not have any drilling equipment on it until just before the Chicxulub Impact Crater expedition, when a drill that is usually used for mining on land was welded to the edge of the ship. The JOIDES Resolution has permanent lab spaces with lab equipment to rival top universities. This allows the science team to describe and gather data from the cores while at sea. The Liftboat Myrtle does not have a permanent scientific laboratory or any spare rooms to turn into temporary labs. So space for labs and scientific offices was created by bringing containers on the ship (they’re the things below that look kind of like a row of porta potties). They are the size of the containers you might see on the back of an 18-wheeler or a train, and they are climate-controlled and provide desk space and some of the equipment needed to begin doing description on the cores (as you can see in the other photo below). But the containers did not provide enough space for all the lab equipment needed, so most of the description and data-gathering from the cores will be occurring on land in Bremen, Germany in September. During a JOIDES Resolution expedition, you board the ship by getting on it at port and staying on it for the next 8 weeks. The Liftboat Myrtle is perched right near the Yucatan Peninsula, so you can board it (like I did) or leave it (like I will) midway through an expedition by being brought back and forth by a transport boat. The kicker is you have to get on and off the Liftboat Myrtle by standing in an unenclosed basket and being hoisted by a crane. Your safety restraints on the basket are your ability to grip a pole. Most of the differences between the ships can be explained because this drill site on the Chicxulub crater is not a location where the JR or the Chikyu can drill. The water here is too shallow, only 56 feet from seafloor to sea surface. To make this expedition happen the IODP and ECORD needed a mission specific platform that could drill a deep hole in shallow water. So they hired the Liftboat Myrtle and customized it to meet the expedition’s needs. There’s actually a lot more differences, so I will write some more tomorrow.